In order to reward customer, a customer account must be assigned to the receipt. Under Cash Register, look for a small Info Button on the right top of the receipt. Click on it to assign customer to receipt. Customer reward or redemption is made during the payment process. 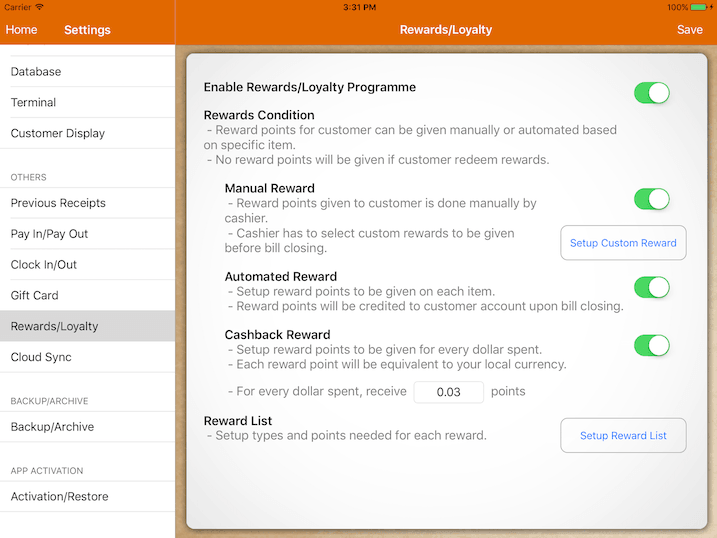 For manual reward, points can be awarded to your customer under certain condition. As the reward condition for it can be broad, cashier has to decide if the condition is met during the payment process. Each manual reward given can be tracked under transaction report. Points will be awarded automatically based on the item purchased by customer. Number of points to be rewarded can be setup specifically for each item. Customer receives point for each dollar that they spent. Points received by customer will be equivalent to your local currency. If they receive 0.50 point from the reward, they will be able to take $0.50 off the bill in their next purchase. Reward list acts like a discount. Setup points required for each reward to be redeemed. If you are running a promotion under certain special condition, use manual reward. Example, free a cup of coffee when customer spends $20 and above. Reward to be given can be 10 points and under reward list, set 10 points is required to redeem a coffee. If you are running a promotion, for every 10 coffees purchased get 1 free. You could setup item coffee to give an automated reward of 1 point. In the reward list, specify the points required which is 10 points to redeem a free coffee. The reward can be a $2 discount which is the price of the coffee. When customer has 10 reward points, they could redeem this reward which will deduct $2.00 off the bill and take 10 points away from their account. If points are given upon spending, setup cashback reward. Each point earned can be used to deduct the total bill amount.